Assigning a resource to a task may require an analysis of the resource allocation data to determine the resource's availability. Using one of the Suggest a Resource functions as you save a task can both save the information and create a report showing the most available resource during the duration of the task schedule. 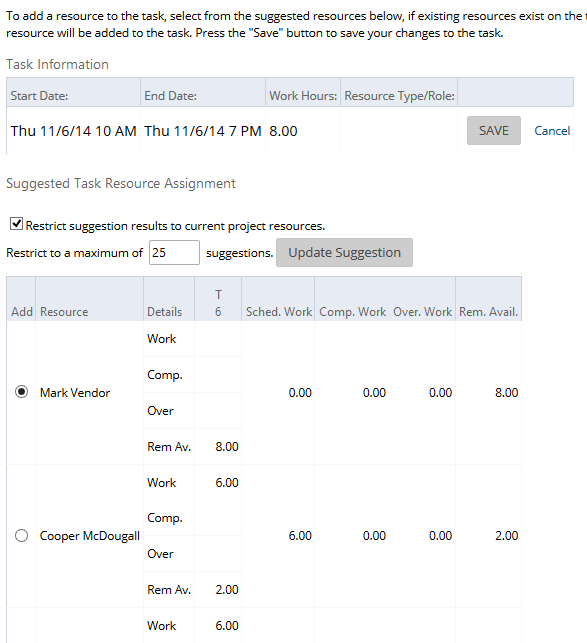 Use either of the two Suggest a Resource save options to look up the resource suggestions upon completion of a task add or edit. Suggests a resource from the current project resource team. Suggests a resource from all system users. The resulting report data when using the resource suggestion utility allows for further filtering on the results to only suggest a resource within the corresponding resource role/type selection.